Hello eP'ers!! I know it's over and done but still I'd like to say Happy Thanksgiving to our U.S. friends. I am so thankful for all of you, U.S. and abroad, friends and customers! Knowing that we even inspire you a little bit is wonderful and you should know that you inspire us too!! Seeing all your great ideas and projects is really so fun! I felt in a bit of a Christmas mood yesterday but sadly I didn't have any of the new holiday stamps from eclectic Paperie - like this one from Here Arts, Aspen Frost Festive Ornaments, or one of these, Folk Art Flurries or Iconic Christmas both from Wplus 9. So I looked at what I did have an got creative! Can you tell what I used? I used Fresh Picked from Wplus9!! That's right! 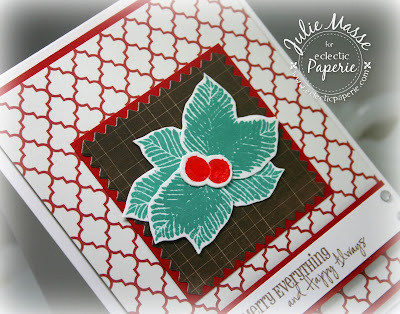 I took the single leaf stamp and used it repeatedly to create my "fir bough" using Evergreen Bough Distress Ink. I just layered them on top to give them plenty of needles! Next I used the blueberry stamp and the coordinating Fresh Picked die to make stamp the berries in Festive Berries Distress Ink. I fussy cut the "bough" and layered 2 together for a fuller look. The berries also got a coating of Glossy Accents to make them nice and shiney! 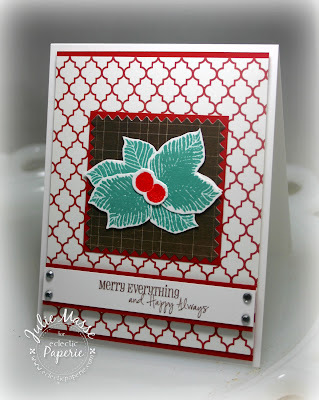 I'm off for a nice relaxing day, including some stamping I hope!! Hope you have a wonderful weekend!